The din from the uptown/downtown 2 and 5 trains on the elevated tracks above White Plains Road was really nothing more than background noise to the constant cacophony that resonated in the frantic Morris Park section of the Bronx where Gerry had summoned us. It was our third straight session in that borough proving that the Bronx could hold its own with Queens and Brooklyn in ethnic food diversity. 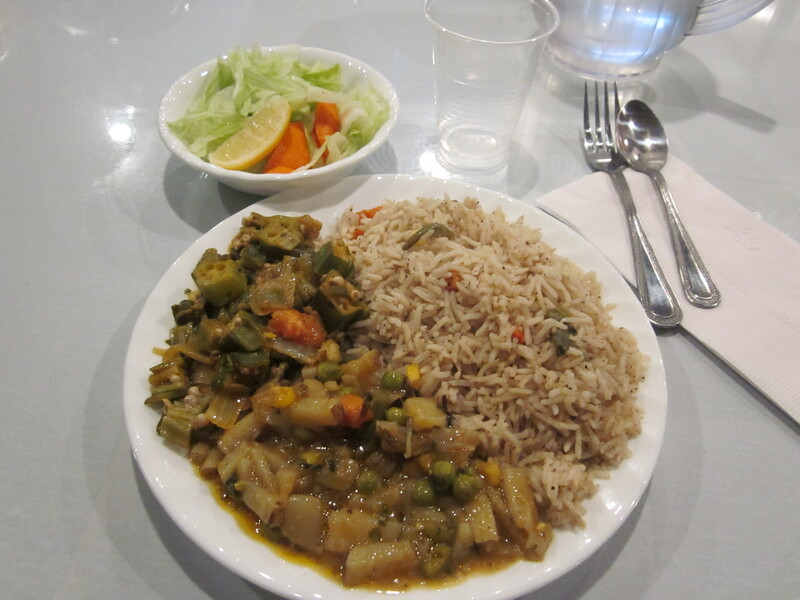 This time we were to sample Pakistani food; strictly Halal; meaning no pork and no alcohol. Forced joy is not one of my strong points, but I told myself to at least make the effort. The lone person inside the restaurant—a young man wiping down a table—didn’t even notice me or my joy as I entered. Compared to the frenzy outside, even with the babble in Urdu coming from the gigantic flat screen television tuned to a Pakistani television station, inside it was calm. 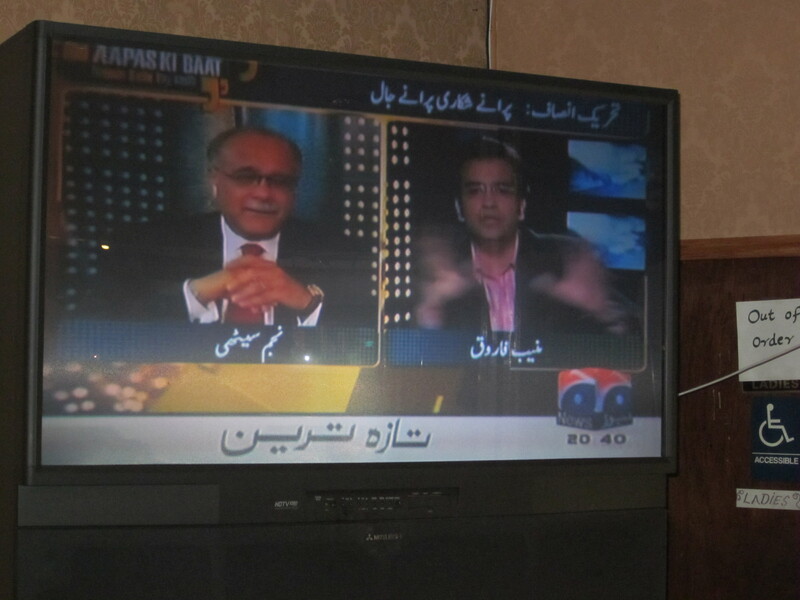 The news from Pakistan was from what I could translate, not good. No one else had yet arrived and due to a last minute work engagement where pork might be served and alcohol most definitely would be, Rick had already bowed out. Soon the others arrived including Eugene, who was daringly dressed in short pants. 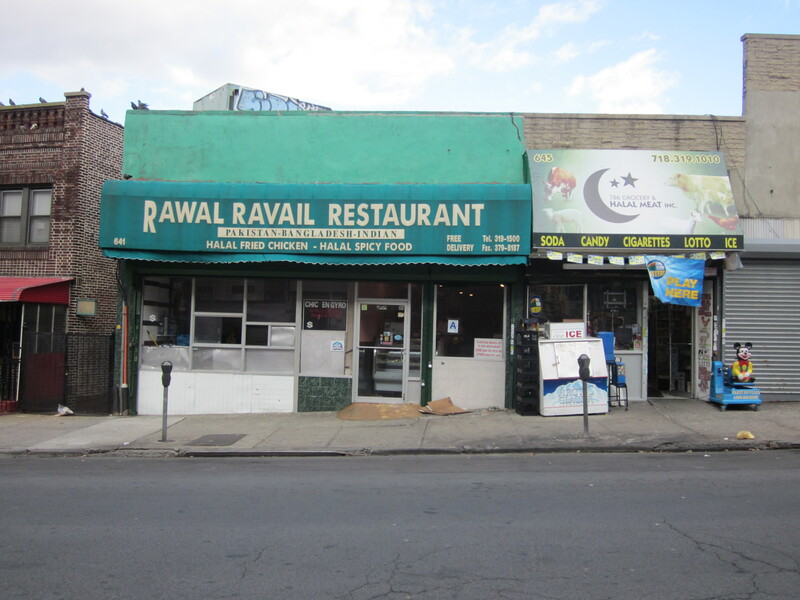 Rawal’s only menus were of the take-out variety and we quickly discovered, pretty much useless. The dour owner begrudgingly had our group come with him to the steam table where he could explain what was available that day. 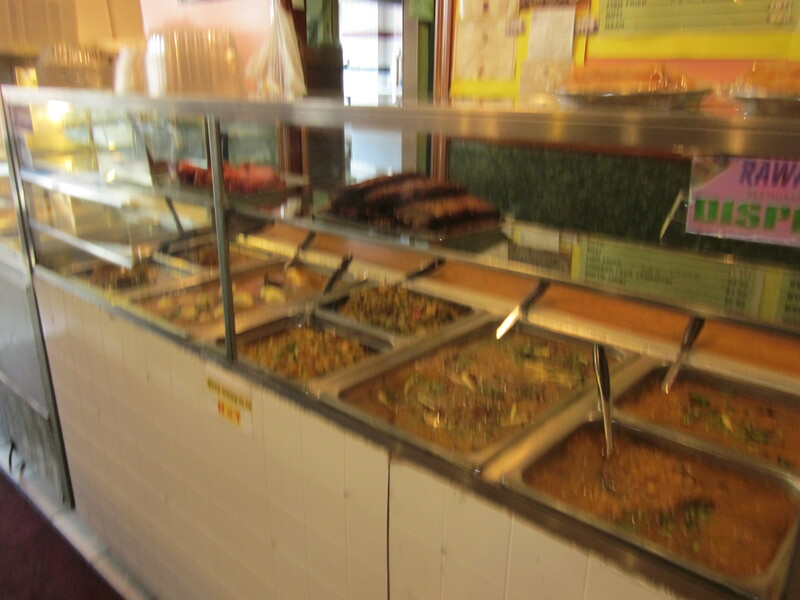 There he pointed to each tray where there were various curries; chicken, goat, and kidney/liver, two vegetable dishes, three solitary small grilled fish, a tray of bright red chicken tikka, and another of chopped grilled chicken. He lifted up the rice containers; two biryanis and one with plain white basmati rice. The process was more complicated than it should have been. To make things easier, we had him fix each of us a platter with a sampling of some of the dishes. And this he did with not a trace of joy. Rawal Ravail’s steam blurred steam table. Within a few minutes, a female server in traditional Pakistani dress, brought us a plate of lettuce, tomatoes, cucumbers, chilies, and a raita dressing. Soon, the man in charge returned, accompanied by his female helper with our individual plates and five, Frisbee-sized loaves of nan bread. Each curry, goat, chicken, and liver and kidney, were fiery. Even the channa (chick pea) and cabbage curry was hot. The only respite from the spice was the rice and bread. All the curries were delicious, but, with the exception of the unique texture of the kidney and liver, very much alike and, crowded on our platters, they bled together making them somewhat indistinguishable. Despite the heat, we quickly devoured our plates with the exception of Mike from Yonkers who was deliberately picking at his liver and kidney, dabbing each forkful into the cooling raita. We tried to be patient and display some level of dining etiquette, but Eugene and I could wait no longer. While Mike from Yonkers continued to maddeningly play with his liver, we headed toward the entrance of the restaurant where there was a display of sweets including a few that were alarmingly colorful. 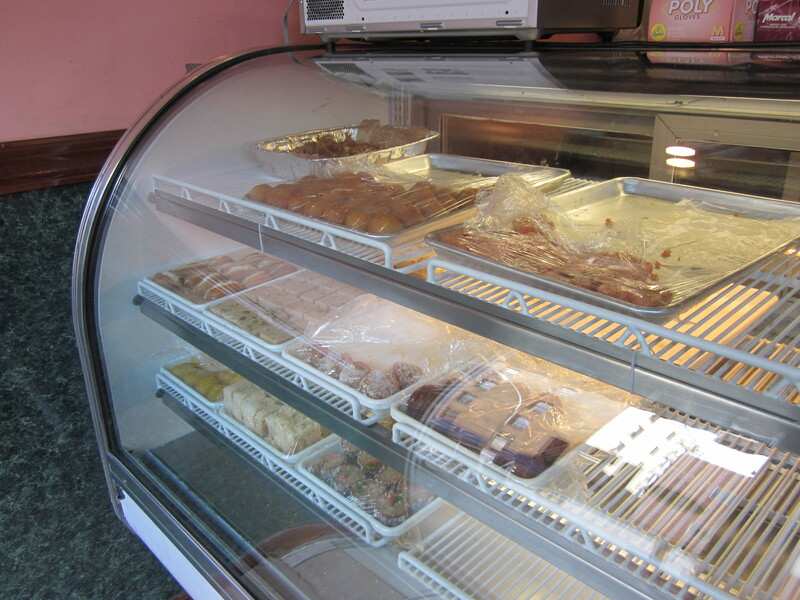 Among them was a tray of milk where blobs of dough bobbled, a pink rice pudding, an orange coconut pudding, and a carrot orange sweet along with a white, nut-filled sweet. Eugene took a bite of the latter and proclaimed it second only to the “lima bean dessert” we had years ago at a Filipino restaurant in Queens, as the worst dessert he ever tasted. Zio added that the carroty orange thing had a distinct cardboard taste. Everyone agreed that the orange coconut pudding was the best of the bunch, though Gerry had no complaints about any of them and what no one else would touch further, he piled in front of him to quickly finish off. The tab; well below our group’s $20 per person allotment left plenty of leeway for a generous tip despite the lackadaisical service. And after handing over our cash to the owner, for the first time that evening a smile was apparent on his face. 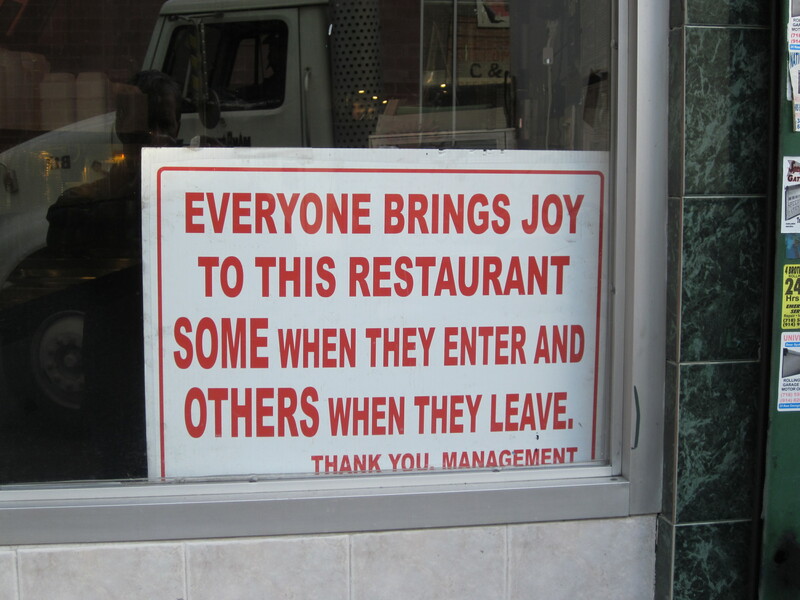 The message on the window, prophetic, for we indeed, upon our exit, brought joy to the restaurant. Our tip left the staff of Rawal Ravail extremely joyous.